The Cabinet secretary in Charge of sports Hassan Wario, has come out strongly to warn fans that they would not be allowed to converge at the Tom Mboya statue anymore. According to Minister Wario, any fans who converge at the statue will be arrested. 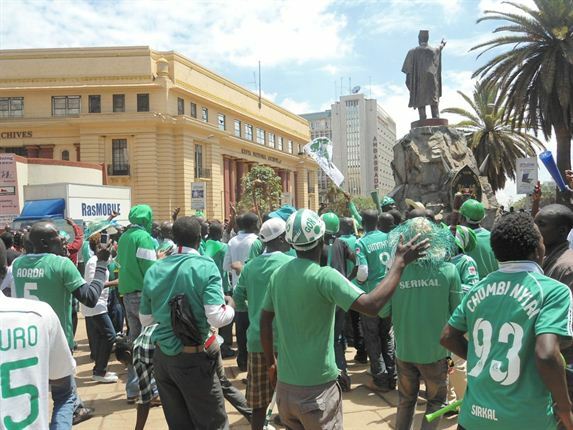 Gor Mahia fans are typically converge at the monument before matches. Dr. Wario, in an address to the media ahead of the Mashujaa Day celebrations, called on the fans to keep off the monument or risk arrest. Several months ago, Minister Wario also lamented about hooliganism. In an agitated speech, Wario blamed clubs saying they should do more to stop the hooligans. According to him, the government provides stadiums while club fans damage the stadia. We noted at the time that Mr. Wario was wrong. Clubs cannot control hooligans by themselves. They do not have the capacity to end hooliganism. It is the government, specifically the police that must deal with hooligans. This is how England dealt with its hooligan problem in the 1980s. It was not the clubs. It is the government that came up with rules on how stadia should be built, procedures for police and specific training for police. Known hooligans were banned from stadia and banned from traveling overseas to attend matches. With regard to the Tom Mboya statue, it is indeed timely for the minister to act upon it. Fans absolutely do need to be prevented from defacing a monument of a respectable person or from defacing any public property. However it leaves us wondering if Mr. Wario thinks hooliganism is the only problem afflicting clubs in Kenya. The first thing Mr. Wario should understand is that clubs are the bedrock on which any national team is built. Without a strong club system, no country can thrive. Clubs provide the means by which young players are discovered, nurtured and developed into quality players. They provide the incentive for the youth to strive to become better players. If the youth believe they can earn a living playing football locally, they will work harder at their game. The net result is that Kenya will have higher calibre players. The most successful countries are those where the clubs have strong infrastructure including training grounds on which they can develop their youth systems. In Germany for example, the Federation has ensured that every club in the top tier league and in the second tier has sound youth systems in which players are scouted and nurtured from U-13 to U-16 and U19. It is no accident that Germany are consistently among the best teams. If Wario really wants football in Kenya to thrive then he should start by getting clubs the assistance they need. Lets start at Gor Mahia. Earlier this year, Gor Mahia was slapped with a malicious KES 118 million fine by the Kenya Revenue Authority which even went as far as freezing all the club’s accounts. It is true that Gor Mahia like many Kenyan businesses does owe the KRA money. But slapping the club with a KES 118m fine smacks of malice aimed at crippling the club.Virtuallu every sports organization in Kenya that pays salaries owes the KRA money. Even the Kenya Rugby Union owes tax remittances from from salaries that have been paid to Kenya rugby sevens players over the past few years. But only Gor Mahia was singled out for harsh treatment. Crippling a club that is going to represent the country in the African champions league and the CECAFA cup is no good for football in the country. There should have been some assistance, perhaps mediation between the Ministry of sports and KRA. Minister Wario can take the lead in harmonizing the way sports organizations remit taxes to the KRA and prevent malicious attacks. Minister Wario can further help clubs by providing land to the top teams in Kenya. Who better than the government to assist both Gor Mahia and AFC to reclaim land they own in Embakassi. The availability of this land can make operating the club much cheaper. Gor Mahia pays KES 10,000 a day to use City Stadium whether its for the senior team or the U-19 team. In fact few clubs in Kenya have their own training ground, with the exception of corporate clubs like Bandari and Tusker. With land of their own, clubs could also build gyms and it would make it easier to run youth development schemes which often requires multiple fields and even classrooms. As has been mentioned above, the only time Minister Wario ever mentions Gor Mahia or AFC leopards it is when condemning hooliganism. The only time Wario ever said publicly that he would meet club officials was when he wanted to discuss hooliganism. Far from promoting the club’s Wario has done a lot to discourage fans from attending matches. Since all he says is about hooliganism, he has done a lot to discourage sponsors from wanting to associate with football. Most fans who attend matches are peaceful. Most football matches are peaceful. Gor Mahia and AFC are not just about hooliganism. These are the points that need to be highlighted. What he ought to be doing is personally attending football matches. Then telling fans that most football matches are actually peaceful. Only a few matches end in acts of hooliganism. He ought to be highlighting the positive aspects of club football in Kenya of which there are a lot. He ought to be highlighting the rich history and successes that club’s in Kenya have accomplished. He ought to be outlining the steps the government to make stadia more peaceful so as to attract more fans to the stadia. Making stadia safer is not just about reducing hooliganism. Seating, security fences, security personnel, ticketing etc can all be improved by the government. As former Gor Mahia official Faiz Magak once said of Wario, “His statements at the event was ill advised and ill timed – that was a national and international event thus portraying Gor Mahia and Kenya in bad light; as a leader he should be careful when addressing the public – he should use sport to promote peace not incite. It would have been better for him to call the stakeholders and talk to them as a leader rather than using the event to soil others’ reputations ” said Magak to futaa.com at the time. On balance, Wario has not had a positive impact on the Kenya Premier league so far. His mere presence at several local matches would encourage fans to attend. This column is not saying that hooliganism is not a serious issue that needs to be addressed. In fact Minister Wario is doing a good thing by highlighting behaviour of certain fans and warning them. This column is trying to encourage the sports minister to be more active in making club football better.More active in promoting local football. It is a fact that the standards of club football in Kenya are currently below par. A significant reason is because many clubs are merely struggling to survive. A stronger club system will making the results of the national team better in the long run. The government and the sports ministry can help in this regard. This writer is 1OO percent correct. May I add this… instead of Ministers and MPs asking for an increase in pay, they should be trying to find ways to increase soccer funding. Sports is one of the most powerful marketing tool. I know of a tourist who knew nothing about Kenya until he googled the country after a Kenyan won the Boston Marathon. He ended up visiting Kenya along with his family and has been to the country twice since then. Who also talk about employment for the youth; soccer can help do just that if investmentments are made by the government. I agree with Wario & I.G that it is not feasible to have a special police force. WHAT IS SIMPLY NEEDED IS FOR THE POLICE OFFICERS ON DUTY TO DO THEIR JOB AND MAKE ARRESTS. WHY HAS NO ONE HAS EVER BEEN ARRESTED FOR VANDALISM & MALICIOUS DAMAGE OF PROPERTY BOTH TO THE TJM’S MONUMENT AND THE STADIA. IT IS INDIVIDUALS RESPONSIBLE FOR THE DAMAGE NOT OUR BELOVED CLUB GOR MAHIA. THESE ARE JUST EMPTY THREATS WE AWAIT CONCRETE ACTION. I disagree with Admin. no matter whether “most” matches are peaceful is irrelevant to the victims of hooliganism/football violence. What do you say to the son/brother/husband whose mother/sister/wife is crudely abused physically & verbally by hooligans, the victim whose vehicle is vandalized on the highway, the innocent fan maimed or injured by a stray stone/bottle. So what if GM is given the land do they even have the capacity to develop it. Haven’t we been given land before? Why should Wario enter into mediation on GM’s behalf when GM’s EC itself has refused to engage KRA. Is Wario supposed to create the records KRA need from Gor officials? Lastly it is for the GM fraternity to put GM on a stable footing financially and structurally before we can condemn those pointing out our shortcomings. Gor Mahia is a former africa club champion while Harambee Stars has never been able to achieve that feat. Gor Mahia can attract non-Kenyan talent while H.Stars cannot. Gor’s destiny is different from H.Stars and it is in our hands not the Ministry of Sports. Let’s form the Sacco and build our beloved club. If hooligans are damaging property as far as Madaraka and Jogoo road and CBD, there is nothing the club can do. Its only the government that can do something. Therefore blaming the club for its fans behaviour does not make sense. Best action to take is to arrest the culprits whose faces are often clearly seen on TV. In regards to the KRA, no Kenyan club, federation or anyone else has records because they have never had to. If the new government now wants clubs and federations to start creating said records then clubs and federations will need assistance or some direction. Almost no federation or club is currently compliant with KRA so singling out one club to make an example of them does not make sense. With regard to land, they do not have to develop it immediately. If Gor Mahia and AFC gets that land, it can save them far more money than would be generated in a SACCO. Developing land is not that difficult. Just having a training ground would save a club over 500,000 per month. Thats way more than the SACCO could generate. Ja Tingare do you realise both you and I have said exactly the same thing in our first paragraphs. Its plain and simple LET THE POLICE ON DUTY DO THEIR JOB. ARREST LAW BREAKERS WHEREVER/WHENEVER THEY COMMIT CRIME. Creating the so called records is not rocket science. You know your players and the salaries they were earning.Tax liability can be calculated and then engage KRA directly (or through the Ministry) on possible pardons/payment terms etc. Remember in law ignorance is no defense. Can you imagine a thief arguing in mitigation that he/she should be excused because there are also other thieves out there stealing!! Kshs.10,000 a day for a training ground. Is that the only training ground available? This are the same ludicrous statements like the 50% statutory deductions apparently being levied on gate collections so that the club ends up with kshs.300,000 from a gross collection of 600,000. IT USED TO BE 20-25% what brought it to 50%? Oduor12 I think sometimes you get tunnel vision when you are stuck on one idea. Developing a piece of land is not that difficult. Primary schools do Harambees and build several classroom blocks. So if Gor Mahia get land, why cant they just do a Harambee to build? Seems easy. Once that land is available, the money making opportunities are unlimited. Aside from saving money, They cant rent it out for training by other teams or for matches. Look this weekend again they are paying the county a hefty amount for the family fun day at City stadium. They will pay again for the club election / AGM, for U19 team training and so forth. This is all money that can be saved if they develop their own land. Faiz magak was correct. Constantly harping about hooliganism does not help anything because the club does not have capacity to deal with hooligans. Thats the governments job. What else is the club supposed to do? Wario misses the point. Its not about a special police force. Its about training police to specifically to deal with hooliganism. Just mindlessly throwing tear gas cannisters is not the solution. Police are poorly trained. GOOD DEBATE WITH VERY SOBER MINDS……NEXT..!!!! Silly really to say fans should not converge at TM statue.. that is a public monument and we have all the rights in this world to converge there…. what the this ineffective minister should have said is that anyone who vandalizes be arrested, and that i agree! He goes ahead to say they have given us stadiums, they as who? stadiums are public property build by our taxes, he should stop making it look like they are doing us a huge favor. I see politics, unnecessary politics… let the govt leave Gor Mahia alone… funny how kra singles out Gor out of all teams in Kenya… i dont even want to get into that! Now they dont want us to pay respect to our assasinated leaders…. nkt! Obviously that cant be kasayas fault….odhiambo@9.
soccer is a team sport and everybody must weigh in for the team to succeed. personally i think kasaya is a very good keeper…commands his defence well regardless of his antics and all.for me,a top keeper and i would welcome him back home with open arms!! @Oswozo Moziek, I am terrified at the news of Kasaya coming back to Gor Mahia. It is true he is a good goalkeeper. The problem is his attitude. The man has no team ethics and that can really affect the overall team performance as has been aptly pointed out by Michael Odhiambo Ogolo. Kasaya is just bad for any serious team.